This incomparable Second Edition of a highly regarded reference has been entirely rewritten and enlarged to reflect the explosion of information and technologies that have emerged since the publication of the previous edition. Strikes the perfect balance between proven traditional approaches and modern methods that promise to yield new products and processes! 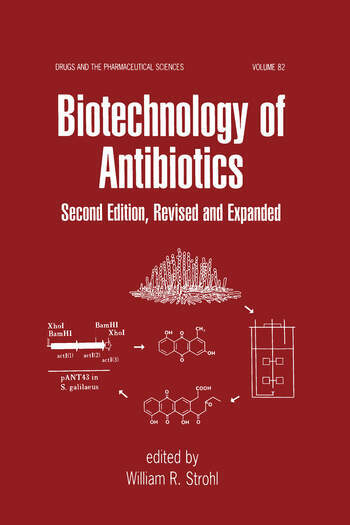 Written by authorities from both industry and academia and containing nearly 4000 bibliographic citations, Biotechnology of Antibiotics, Second Edition is an outstanding resource for pharmaceutical scientists, medicinal chemists and biochemists, molecular biologists and industrial microbiologists, chemical engineers, fermentation bioengineers, bioprocess technologists, and upper-level undergraduate and graduate students in these disciplines. …a well-organized compilation of information on antibiotics which have found practical use in medical, veterinary, and agricultural practice…well written…a good reference work for those interested in antibiotic screening and production. "…a very useful book…it is a great help to have in one book an account of the production of most of the current antibiotics.